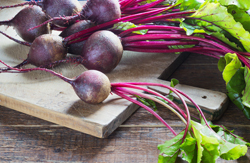 Sauté the beet tops in the olive oil of your choice and add a splash of Lemon White Balsamic Condimento. Season with salt and pepper to taste and place on serving plate, topping with the baby beets. Serve at once. Remove the skins while warm and cut in half. (To make the job easy, rub the beets between two sheets of paper towel.) Cut beets in half. Wash the beets thoroughly. Cut off the tops and reserve. Place washed beets in a roasting pan, toss with Galega, Arbequina or any other good Extra Virgin Olive Oil. Add the rosemary sprigs and roast for about 30 minutes.